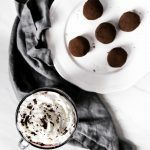 These Hot Chocolate Truffles are the perfect addition to an adventure at Snowshoe Mount Resort in West Virginia. Place all of the ingredients in a medium pot & melt on medium-low heat, stirring frequently. Once all of the ingredients are combined pour the ganache into a bowl, cover with plastic wrap, & place in your freezer to chill for 1-2 hours. Once chilled, create truffle balls with an ice-cream scoop, about 2 tablespoons each, & place them on a baking sheet lined with parchment paper. Pop the truffles in your freezer for 1 hour, or until thoroughly chilled. You can then leave them as is or roll them with a variety of toppings like cocoa powder, crushed peppermint sticks, melted dark chocolate, or tiny marshmallows! Store in a sealed container in your fridge for up to 2 weeks. Drop 1-2 Hot Chocolate Truffle in a mug of hot Core Power® Chocolate (14 ounces) for a delicious hot chocolate experience!